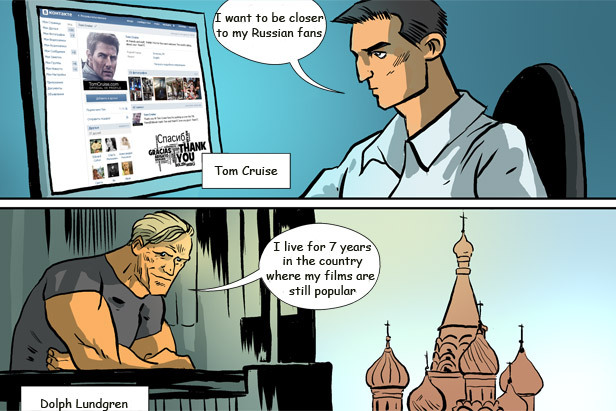 Tom Cruise has joined Vkontakte, a Russian social networking site, posting messages for fans on VK.com. Dolph Lundgren has bought an expensive apratment in the Moscow's center. Bruce Willis is back for the latest installment in the "Die Hard" franchise. The film finds his character traveling to Moscow to find his son. Leonardo DiCaprio's maternal grandmother was born Yelena Smirnova in Russia. Now the actor is searching for his relatives who might live in Russia and post-Soviet republics.